The Finance Authority of Maine (FAME) celebrated another year of successful business and educational partnerships at its annual meeting and awards event, Showcase Maine. This year’s event was held on Tuesday, November 14, 2017, at Portland’s Holiday Inn By The Bay. Approximately 300 guests were in attendance, as well as over forty exhibitors. Showcase Maine is FAME’s annual celebration of its successful partnerships with Maine’s business, lending, governmental, and higher education communities. The evening featured a reception, including a showcase of exhibits by Maine businesses and educational organizations that partner with FAME; a dinner and awards presentation; and a keynote speech by former United States Senator George Mitchell. Hon. 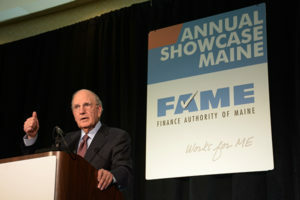 George J. Mitchell addressing attendees at FAME’s Showcase Maine 2017. Mitchell, a native of Waterville and a former United States Senator from Maine, has enjoyed a long and distinguished career. He served for several years as Chairman of DLA Piper, and now is Chairman Emeritus. Prior to that he served as a federal judge; as Majority Leader of the United States Senate; as Chairman of peace negotiations in Northern Ireland, which resulted in an agreement that ended an historic conflict; and most recently as U.S. Special Envoy to the Middle East. In his remarks, the former Senator optimistically addressed the nation’s past and future challenges, with particular emphases on the changing economy and technological advancements, and their resultant impacts on the workforce. Following his remarks, he responded to numerous audience questions. Casco Bay Food & Beverage offers traditional and healthier refreshment selections to meet Maine employees’ nutritional needs and help boost energy and productivity at work places. An independently-owned Maine business that serves fourteen of Maine’s sixteen counties, the company provides a full array of services, including traditional vending (snack and beverage machines), micro-marts, convenience stores at business locations, full-service cafe operations and dining, and office coffee and sundry supplies. FAME will be recognizing this company for helping to preserve its Maine ownership. The company was the recipient of FAME’s largest loan insurance approval last year, in partnership with Camden National Bank, which helped to create and retain 545 quality Maine jobs. 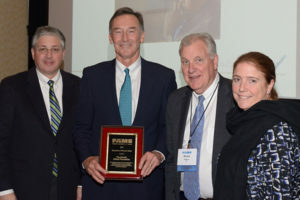 Founded in 1950, the Foundation furthers the philanthropic legacy of the late Harold Alfond, founder of Dexter Shoe Company and a longtime supporter of Maine communities and institutions, including two programs which FAME helps to administer: the Harold Alfond College Challenge and the Alfond Leaders Student Debt Reduction Program. This is the bank’s eighth time as an awardee. Over the past year, Camden National partnered with FAME on 46 loans totaling over $17.3 million. This in turn helped to create 110 Maine jobs and retain an additional 435 jobs. In addition to being a top partner in bringing business to FAME, Camden National has grown remarkably in recent years and is actively committed to the communities in which it operates. 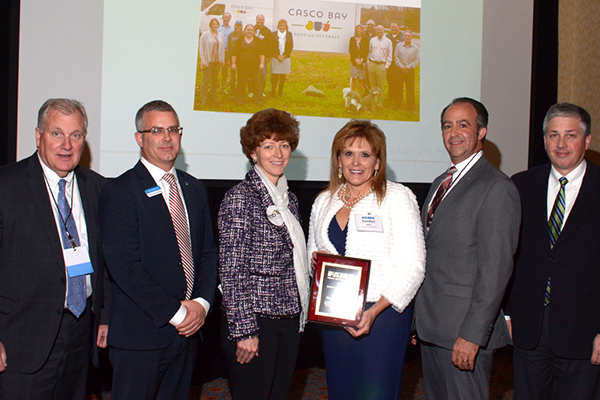 Machias Savings Bank is being recognized in the category for lenders with less than $1.5 billion in assets. This past year, FAME partnered with Machias Savings on 47 loans to Maine companies totaling over $12.7 million. This helped to create 86 Maine jobs and retain an additional 298 jobs. Machias Savings is dedicated to serving Maine communities, contributing many hours of volunteer labor and generous financial donations to worthy causes. Earlier in the day at the regular monthly meeting of the FAME board of directors, new officers were elected for 2017-2018. These include: James (“Jay”) Violette, Jr., of Waterville as Chair; Richard Roderick of Cape Elizabeth as Vice Chair; and David Daigler of Portland as Treasurer.